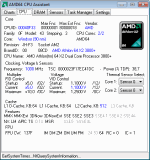 AMD64 CPU Assistant is designed to monitor the temperature of a AMD64 CPU core for AMD64 K8 processor's (Socket 754/S1/940/F1207/939/AM2/ASB1/S1g1) using the on-die thermal sensor. S.M.A.R.T. Assistant is designed to monitor the S.M.A.R.T. status and the temperature of a harddrives, as well as manage AAM (Automatic Acoustic Management) and APM (Advanced Power Management) your hard disks. The program is designed to manage through a remote control and IR receiver tuner Beholder or Compro programs maintaining a connection to WinLIRC (KMPlayer, Light Alloy, Media Player Classic, BS.Player, WinAmp, AIMP, foobar2000, ProgDVB and others). Program Guard Assistant is designed to provide remote monitoring with the maintaining of the video archive, and as a source of video can be a web camera or analog camera connected to the TV tuner. The program is designed to be displayed in the system tray of the current input mode (uppercase/lowercase). SMS Assistant is designed is designed to remotely control the computer using the SMS-messages received by a computer connected to a 3G-modem. The application GeigerCounter is designed to to measure background radiation (radioactivity level), together with the dosimeter that can be connected to the audio jack of the smartphone. I have developed such a dosimeter described on page http://acdc.foxylab.com/node/32. The complex of the dosimeter and Android-smartphone with the application GeigerCounter allows you to quickly measure the level of radiation on the ground and in the rooms. Midlet "CPLX" is intended to perform operations with complex numbers (addition, subtraction, multiplication, division) and the translation of complex numbers from one form to another. The logic of the MIDlet is similar to the logic of the scientific calculator.